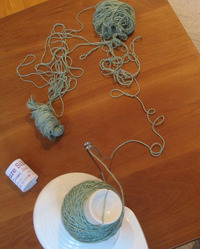 If using Berroco Touché for this project, be aware that the sweater may grow in width after it is completed. 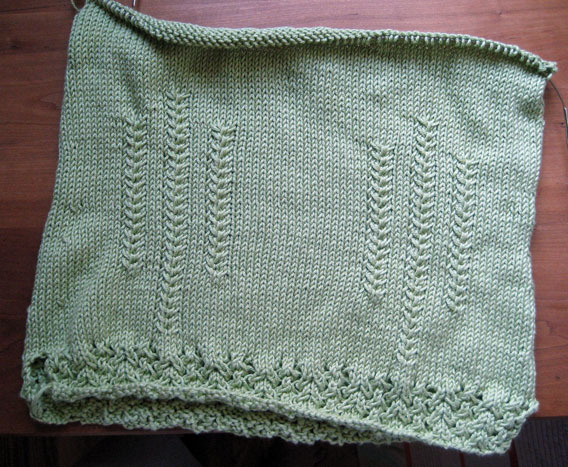 The sample I knitted (over four years ago) for the pattern has increased in circumference by two inches, while another knitter reported to me that hers increased in circumference by 4-5 inches. 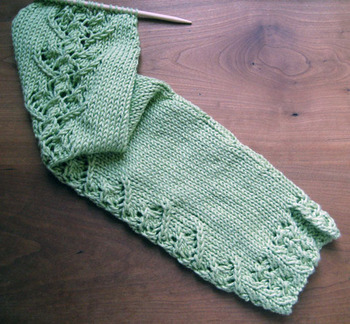 In both cases swatches were made before knitting the sweater, and after wet blocking the gauge of the swatches appeared to be correct. For patterns purchased before 3/22/08: Under the heading "Raglan Decreases" for sleeves, the directions for the first RS row state, "...k to X* sts before end...," when they should state "...work to X sts before end," because the Four Sisters stitch pattern continues up to the top of the sleeve. Patterns purchased after 3/22/08 have been corrected. *X = 4 or 5 sts depending on size worked and place in pattern. Here I've tried to show more of the Four Sisters detail on the sleeve. Qui ho provato farvedere piu del dettaglio "Quattro Sorelle" sulla manica. I just hope there's no ripping ahead. Well, I didn't do any knitting on the red-eye from Boston to Europe (are you kidding? 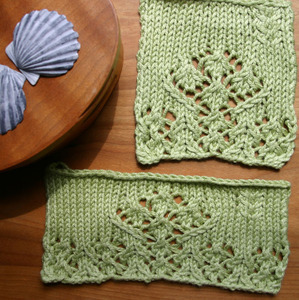 !--I was trying to get a few hours of sleep), but somewhere, somehow over the last few weeks, while packing and moving the family back to Italy for the school year, I've managed to finish the sleeves of my Four Sisters pullover. The lace panel runs up the outside of the sleeves, and I've decided to try raglan sleeves and a wide, scooped neck opening, with a neckband of Bead Stitch knitted on after seaming the body and sleeves. In the second photo the sleeve vent is visible; placing this took some thought, because I realized that my first idea, to put the vent on the outside (opposite where the sleeve seam would be, if the sleeve had not been worked in the round), would have messed up that nice segue from Bead Stitch to Four Sisters. Instead, I put the vent further to the back of the arm; although after I knit the first sleeve, I looked at all of the sleeve vents on all of the jackets hanging in our closet, and saw that almost all of them are just slightly behind the point opposite the underarm seam. (I wish there was a less cumbersome way of describing this, but I can't think of one.) Anyway, although this seemed too minor a detail to require re-knitting the entire sleeve (unlike my earlier sleeve wars), I may put the vent there when I write up the pattern. If I like how the vents look after blocking, that is. 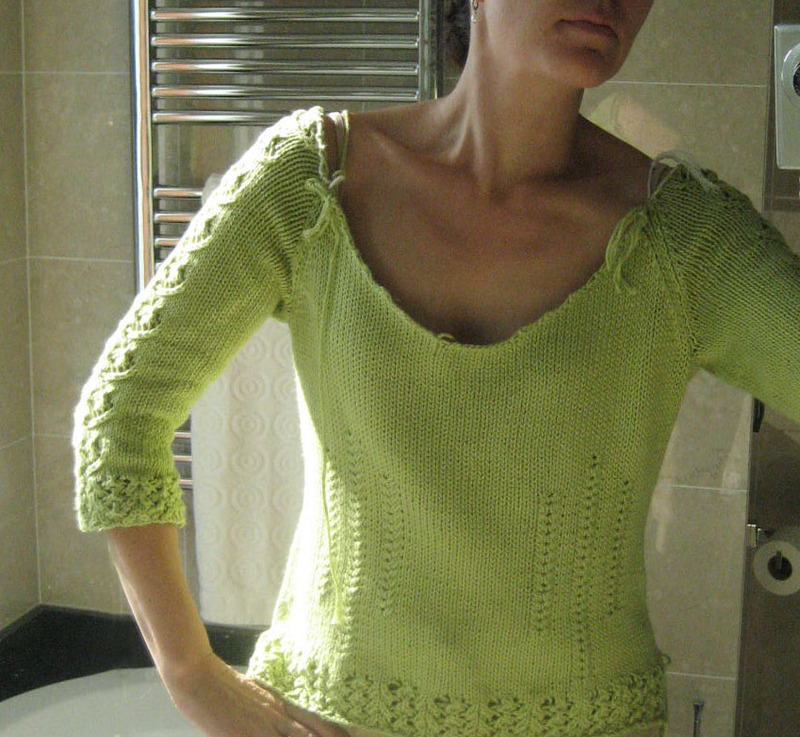 Here is the body of my Four Sisters pullover, and as you can see, there is no Four Sisters to be seen. What happened was that, once I had decided to use the columns of twist stitches to help with shaping (they weren't enough to do the job by themselves; if you look closely you will also see shaping decreases and increases along the sides), I looked at putting the Four Sisters panel either up the center back or along the sides, and decided it just looked too busy. I decided this with great regret, because I love the pattern, but sometimes too much of a good thing can be, well, you know. But fear not, Four Sisters will make its appearance on the sleeves. Along the split (visible on one side) hem, in unblocked crunchy form, you see Bead Stitch; I liked the edge of my Bead Stitch swatch, so I decided to use a split hem for both the body and the sleeves. Does the shape look a little boxy to you? It does to me; I'm hoping that when blocked, the stockinette stitches will open more than the twisted stitches, and yield a shape with a little more narrowing at the waist. 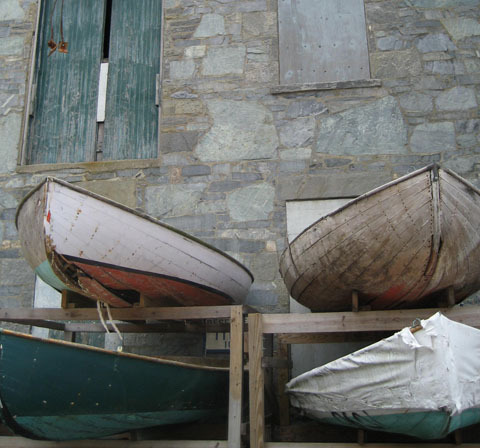 I leave you with a couple of photos from our last sailing trip of the season (Cuttyhunk; Newport). 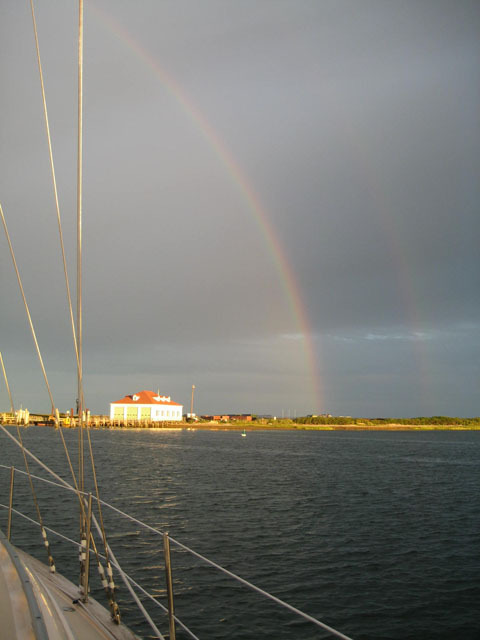 Have you ever seen a double rainbow? 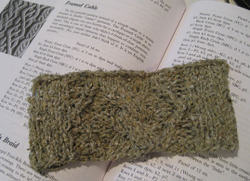 Here is the Berroco Touche in Green Tea, swatched into Bead Stitch and Four Sisters. For the top swatch I used U.S. size 8 needles, as recommended on the ball band; when I first looked at the yarn and ran it through my fingers, I thought size 8 needles sounded big, so I first tried U.S. size 6 needles (the bottom swatch). That's not a color change in the bottom swatch, just a shadow. I like the results better with the suggested size 8's, so that's what I cast on with for the pullover. 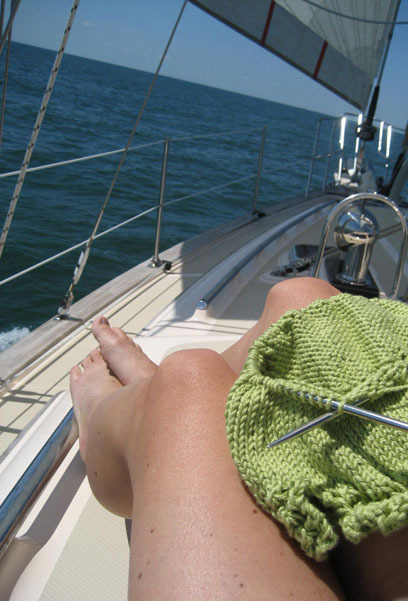 And then I took my knitting and set sail with the family for Nantucket. Next post I'll have some photos from our island weekend, but for now, suffice it say that I got some knitting done in some very pleasant surroundings! 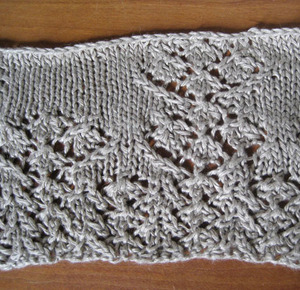 Well, I have to admit that the Debbie Bliss Pure Silk is very pretty when knit up. It's odd to work with because it's so slippery; I often felt as if the stitches I was working on were very loose, and yet the stockinette sections turned out to be very uniform--thanks to the slick yarn correcting its own tension, is my theory. 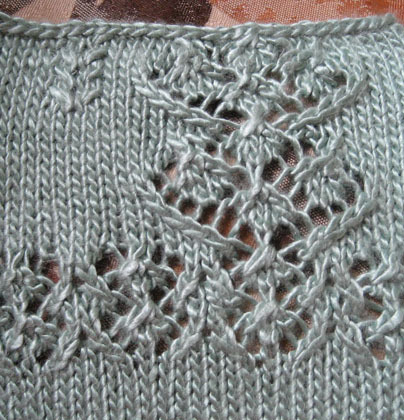 I think the bead stitch at the bottom flows nicely into the Four Sisters motif, and the little cicatrice near the left top is my idea for a shaping device; although I haven't decided exactly where the columns of Four Sisters should go on this pullover (arms yes, but sides too? Or back? ), I have decided that I want to accomplish most of the shaping with changes in stitch patterns, so I needed a dense stitch pattern that plays well with the others. 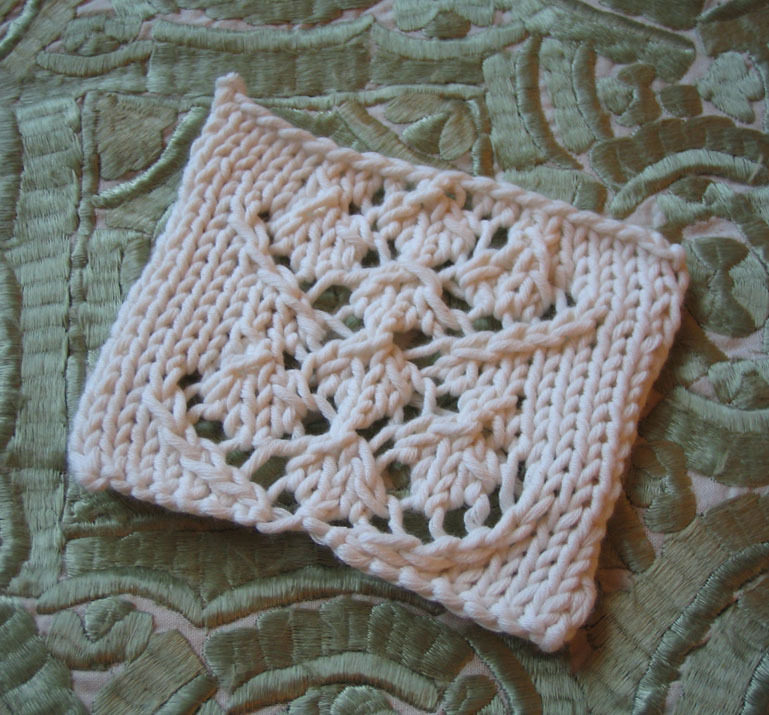 (Not shown: the picot hem swatch I tried--didn't really like it with this yarn or the other stitch patterns). Next: Euroflax Sport Weight. Machine washable AND dryable! 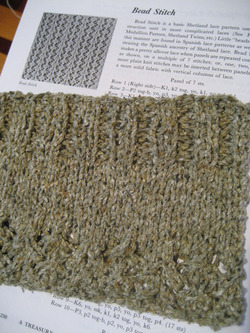 I haven't worked with many variegated or nubbly textured yarns before, so after knitting up a swatch in my Shire Silk, I was quite disappointed to see that the Bead Stitch pattern, from which the more complicated Four Sisters pattern is derived, was quite lost amidst the nubbles. I suppose a larger needle might have helped, but the stockinette portion seemed about right; I didn't want it any looser--nor did I think it was worth swatching the Four Sisters, given what I had already seen. 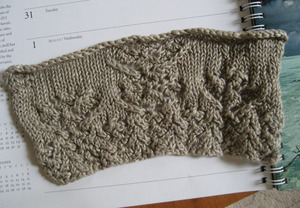 The Bead Stitch is at the bottom of the swatch, while at the top is a simple rib; I was wondering whether any stitch pattern would show up in this stuff. Then I thought that perhaps a big cable would be nice, so I tried that, with so-so results. 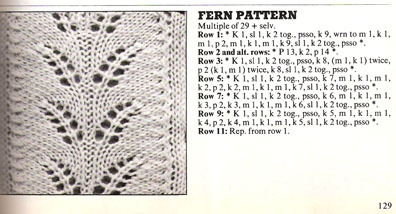 This "Framed Cable" pattern is really great, too, pictured on the far left in the book; I'll have to use it for something else. So what to do with this Shire Silk, in what is a nicer color than it appears in the picture (mainly a light silvery green which reminds me of the foliage of a Russian olive tree)?? If it is destined to be a slouchy pullover in mostly stockinette, then I will definitely have to get one of those knitting machines. So I shelved the Shire Silk for now, and moved on to my second choice: Debbie Bliss Pure Silk. Wow, this is slippery; so slippery that when I pulled it off my ballwinder, it promptly collapsed. I tried to rewind it, and here is the resulting mess. Not only is it slippery, but it twists around itself if given the chance. I finally had to cut it in a couple of places, which for someone like me, who abhors working in ends, is highly annoying. 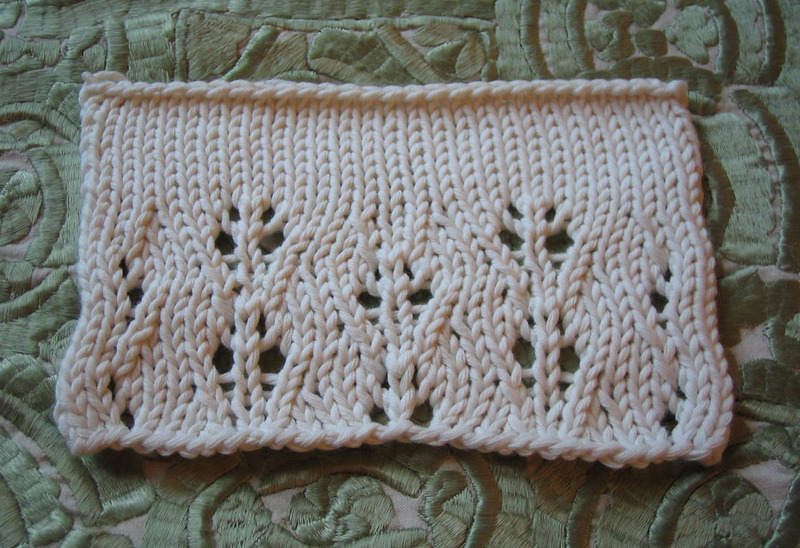 Here is the swatch for the Traveling Leaf pattern from my last post. Do you recognize it? It looks somewhat different than the book version, I think because the needles are smaller in relation to the yarn gauge. Still pretty...but I'm not going to use it for this project. Ecco, "Traveling Leaf"; lo conosci? E diverso che il foto nel libro, ma ancora bello. (Come si dice "swatch" in Italiano?) Ma non lo usaro` per questo progetto. 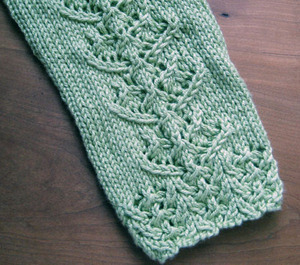 I love this stitch pattern! Love it. Although I didn't love the asymmetry of the central double decreases, and started experimenting midway; I think the decrease direction either needs to be alternated, or changed to a vertical double decrease, where the center stitch is on top. I'm not going to use it for this project, but I already have other plans for another sweater using it, along with the perfect name: "Sorelle," the Italian word for "sisters," since the pattern stitch is "Four Sisters." Amo questo disegno! Ma non amo la mancanza della simmetria nelle diminuzione; io faro` un po` diverso. Usaro` questo per un' altro progetto; chiamaro` "Sorelle," perche il disegno e chiamato "le quattro sorelle." Perfetto, non e' vero? As for the Fan Shell pattern, I decided it had a little too much openwork for my purposes. 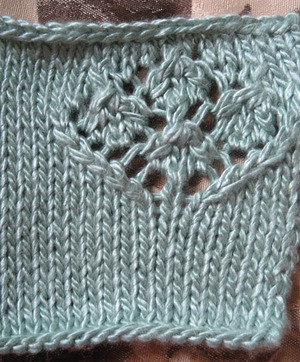 Here is the stitch pattern I chose; next time, the swatch and perhaps, a little progress! Ho deciso che "Fan Shell"...non so, come si dice "openwork" in Italiano. Ecco, il disegno ho scelto; la prossima volta, magari un po` di progresso!